Yuval Lion has toured and recorded with some of the world's most distinguished rock, pop, r&b and jazz artists including Chrissie Hynde, Sharon Jones and the Dap Kings, Trixie Whitley, Meshell Ndgeocello, Chocolate Genius, Lionel Louek,Marc Ribot, John Zorn and Moroccan singer Hyndi Zahra. A native of Tel Aviv, Lion has toured and recorded with Israel's top artists including Danny Sanderson, Alon Olearchik, Danny Litany, Eran Tzur, Korin Alal and BatSheva Dance Company. 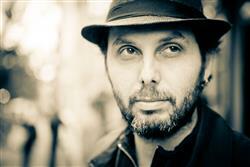 He has appeared on numerous prime time television shows backing up Israel's top artists and bands. After receiving a scholarship from the Berklee College of Music he relocated to Boston in 1997. He is currently based in New York City where he is in high demand as a session drummer. For his solid groove and exceptional tone Lion is sought after by today's leading music producers including VIctor Van Vugt (NIck Cave, Chrissie Hynde, PJ Harvey Beth Orton), Dave Sitek (TV on The Radio, The Yeah Yeah Yeah's) Hector Castillo,Bjork, David Bowie), Andres Levine (David Byrne), Thomas Bartlett (Doveman,The National, Trixie Whitley). Lion tours internationally with acclaimed singer/songwriter Martha Wainwright with whom he recently appeared on NBC's Late Night with Jimmy Fallon. He currently plays with the uber cool New York based band Cibo Matto. In addition to worldwide tours Lion maintains a high profile in New York City's live and studio scene.